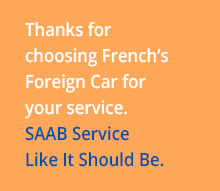 In order to provide the best personalized service for our customers, French’s Foreign Car encourages you to make an appointment for your SAAB. Thank you for choosing French’s Foreign Car for your service. Which SAAB year and model do your drive, and what can we do for you?